MILAN (Reuters) – An Italian newspaper has been criticised for distributing free copies of an annotated version of Hitler’s “Mein Kampf” with a paid supplement to Saturday’s edition. Acknowledging the controversy in an editorial, editor-in-chief Alessandro Sallusti said nobody could suspect the move to be an apology for Nazism and the global Jewish conspiracy posited in the book written between 1924 and 1926. “The concerns of our friends of the Italian Jewish community, who always have and always will see us by their side … deserve all our respect,” Sallusti wrote. Il Giornale on Saturday started selling an eight-volume history of the Third Reich, with the annotated copy of Mein Kampf free for readers who buy the first volume. 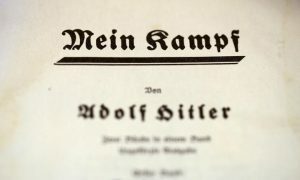 A 70-year copyright on Hitler’s book held by the state of Bavaria expired at the end of 2015, prompting Munich’s Institute for Contemporary History to re-issue it as an annotated version earlier this year in an effort “to thoroughly deconstruct Hitler’s propaganda”.